On Friday, the Supreme Court ruled that gay marriage is now legal in all 50 states. 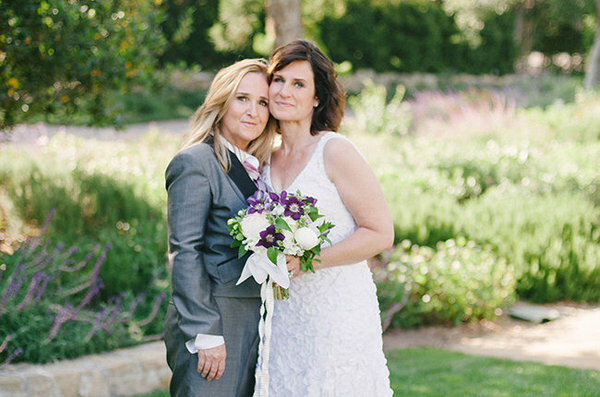 Below, Melissa Etheridge shares her thoughts on the landmark ruling. Twenty years ago, 10 years ago, we knew there would have to be that case that was brought in front of the Supreme Court because you're not just going to find a politician who's willing to stick his neck out there -- or her neck, or anybody's neck -- and it took a philosophical and non-religious and non-emotional look at the Constitution: "What does it say? Are we denying people in our country one of their civil rights?" And that's all this was. That's the beauty of our constitution and our government that that's what it takes. That's our system of checks and balances, that is the beauty of the way this works that we get to work it up through our higher courts until we get to the point where the highest court says, "Yup, you know what? They're people too and this is a right and you're allowed to it across all 50 states." And it's beautiful. The beautiful thing is, the more this went on and on, the more society's views of it changed, the more the stigma changed. It gave us 25 years of our generation to come out, for people to actually come out of the closet so that people know somebody in their family or down the street or at their job who's gay and they can say, "They're people," and it just takes that long for a gene ratio to really let it sink in on this level. Of course, for us, it's like we were there 25 years ago. But it takes what it takes, and we got here and, for god's sake, let's celebrate. This is beautiful. This is our gorgeous democracy in action. The change we are seeing is absolutely brought on and made possible by the gay community itself coming out. Saying to itself, "I deserve. I am a citizen of the United States. I am not outside of this. This is not something that is secret that I just keep to myself. I am a person and this is one of the colors that I am." And by doing that, by becoming part of the American fabric, by being visible in the American fabric -- not just celebrities and such -- people every day, in work and families everywhere... good citizens, they just come out and that is absolutely what the whole rest of the world feels: That they know someone who is gay. And that brings about the change. [Twenty, 30 years ago] it was the fear -- there was so much fear that was coming from gay people and straight people who were like, "Oh you can't be out, it'll ruin your career." It wasn't them; there was somebody else. There was someone out there who was going to take away something from you if they knew you were gay, because we all know it's wrong. There was this kind of... We had decades and millennia where "gay" was something you'd get killed for. And that's a big healing to come to. Forty-five years ago, Stonewall -- isn't that poetic that it's almost the anniversary? That's beautiful -- forty-five years ago, we were just standing up and going, "No, you are not going to cart us off to jail. We're gonna fight. We are not illegal." And that's what it took. And that's what it takes for change. Part of me thinks the more people like myself and Ellen and k.d. lang and that sort of mid-'90s wave that happened, all of a sudden on the other side, you also have the Westboro Baptist Church and Jerry Falwell and those others -- [they] did more for gay rights than anybody. Because when 9/11 happened, and Jerry Falwell said, "It's the gays' fault," then good people go, "Wait a minute, well that's not me." And when they started picketing sad funerals and becoming about hate, then more people identified not with that, they identified with, "Oh, well I must be for it, because I'm certainly not that." That sort of obvious fear and obvious hatefulness and bigotry really helps people go, "I do not identify with that." [Friday's ruling] is mostly just about a celebration and an understanding that it's a part of civilization now. All around the world, you can see how citizens gain their rights, as they feel more comfortable being individuals, being diverse in a country that is celebrating diversity. Growing pains are so painful. Alongside all this news of the Supreme Court is also news of the funeral in Charleston, so we see we are just face-to-face with where hatred gets you, where fear of the other gets you. It's a dead-end road. I believe that civilization in general, civilized countries, people who understand if we're gonna get through this is, if we're gonna move ahead to the future at all, we need to understand we are all completely diverse living on this one beautiful planet. And tolerating -- not even tolerating, but celebrating and understanding and living side-by-side with diversity is the very definition of freedom. All these Republican presidential hopefuls -- just seeing how Jeb Bush is trying to say, "I can have it both ways. I can walk the line." His quote was "While I think marriage is between a man and a woman, I think we should love our neighbor." It's like, "What?" And then the ones [saying], "No! This is a travesty!" It's like, "Wow, you're still going to hold that? This old little divisive issue that just really backfired on everybody?" To be poetic: Hate doesn't win out over love. There is no dark that is dark enough to put out a flame. That doesn't work. The other one always wins. Even though I know these people are coming from a really religious place, they come from a place of fear: "I've got to protect my family and myself from them, from the other." You've got to just let that go. The other is us. I love our democratic process. And it might take us some time, but the debate that we, as a country, go through helps the whole rest of the world find a way to come to the freedoms that we enjoy in our country.